*Kim Kardashian has a new look. 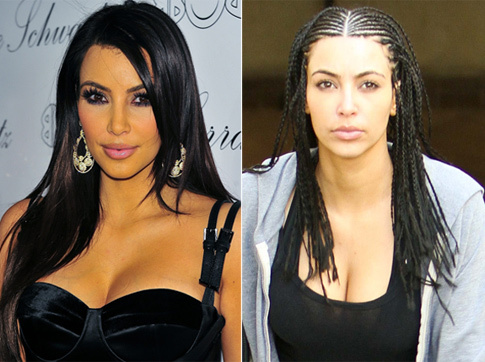 Ala Bo Derek, we guess she’s getting in touch with her sista side because she’s now sportin’ braids. And please hold the hate bombs; the crack was only a joke. Kardashian was conveniently caught by the paps entering a gym an LA gym on Thursday with the new ‘do. Speculation is that it has something to do with a new song/video she recorded with Kanye West. Apparently she got the braids put in on Wednesday. Kardashian is reportedly working on her first studio album with producer The-Dream. She has to wear braids to work with black artists? They Want to BE us! SMH…She is reaching a bit too far too me. I am going to go out on a limb and state that in 2011, I want do not want to see and hear every little thing about any of the Kardashians. Guess they’ll be calling that style “the Kardashian look” now that she saw fit to “lift” it. Y’all need to quit hating. She looks nice with those braids and y’all know it. Sure she has no talent….correction, she catches loads in her mouth like a champ no other. Just ask Ray-J. LOL! !